Had this work been written and performed in the 1920s it would have been likely to have been classed as a ‘Radio Opera’. Composed in 1933, it falls wide of the mark, yet this is the best description for this operatic burlesque. 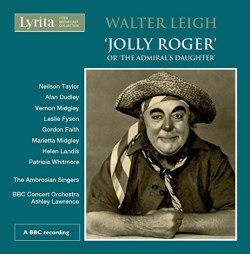 The result is a vivacious ‘romp’ on a nautical theme, in which Leigh weds modern overtones to a traditional, romantic score. The lyrics are by Devonian V.C. Clinton-Baddeley (1900-1970) based on a book by Scobie Mackenzie. Wimbledon-born Leigh probably met Clinton-Baddeley when at Cambridge where he immersed himself in productions there. The musical played to West End audiences at The Savoy in 1933. A couple of years later, in adapted form, it played in Sydney at The Criterion Theatre in 1935. Its popularity was such that it was made into a TV movie in 1948. After the Second World War little was heard of Leigh's music, yet before the war he was a prolific composer with a promising future until killed in action. Thoughtfully, the BBC broadcast the work post-war in two versions: the later one we hear on these Lyrita discs carrying seagull effects to provide added saltiness to the music. There is well-written spoken dialogue, probably abridged for broadcast purposes, and it is convincingly delivered by the well-rehearsed cast. It all runs at a fast pace. The chorus of pirates and maidens provides a prop for the main characters who perform with energy and commitment. Their Welcome chorus number is catchy and introduces initial colour. Songs like The Myrtle Tree (CD1 tr.13), sung with good clarity by Vernon Midgley, carries an Ellis/Novello-like charm. The stirring concerted Finale which unusually ends on dialogue followed by a chord crescendo is novel and provides better impact than always having a musical chorus singing right up to the curtain. Governor Venom’s firm performance with booming resonant voice is characteristically authoritative. Act II opens with a hymn-style chorus number, providing added attraction in the shape of a running bass figure. In this number the Ambrosian female chorus are well toned. The Bloody Pirate’s My Obsession is Oppression reminds one of Jones’ The Geisha. The languid duet, Sweet William flows with dreamy countenance in the hands of Alan Dudley and Helen Landis. Both are well suited to the music even if they end the number with some slight insecurity. Here Leigh’s music is particularly engaging. Of the singers, Marietta Midgley is a voice with excellent top though low notes are underpowered and sometimes become drowned by the orchestra. Her breezy phrasing provides good warmth. At times her flutter-vibrato — in vogue in the 1930s — is, to me, somewhat off-putting. The tracking indices generally follow the scenes and not the start of the vocal numbers. Technically, the orchestra balance is set on the high side and singers struggle to punch through their melody line. Excellent notes are well researched by Paul Conway and, understandably for this genre, appear in English only. The transcription from tape is good: only a small drop-out was noticed at the start of CD2. A word should be said about the recording. It is taken directly from a broadcast by Richard Itter who semi-professionally taped many BBC concert performances between 1952 and 1996, some of which were transferred to acetate disc. The mono frequency response is good with no interference. In addition to Leigh’s operatic pieces, he wrote other good works that should be better known. The LPO recorded his incidental music to A Midsummer Night’s Dream and his Agincourt overture on Lyrita SRCD.289 (reviews). The Locrian Ensemble recorded two of his Sonatinas, a String quartet, and other music for strings on Dutton. Adventurous in style, I consider Leigh a composer worth further exploring and he wrote at least three other light stage works including, The Pride of the Regiment.